Description A cool action shooting game with 15 challenging levels. 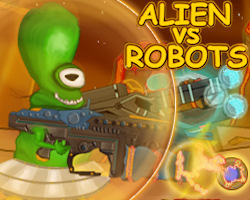 You control the alien in his flying saucer and you have to take down the enemy robots. Collect diamonds and upgrade your weapons. There are 9 powerful weapons and 4 special powers you can use to create more destruction. Arm the alien with guns in the inventory screen. Are you skilled enough to unlock all 24 achievements? Controls Move with the arrow keys. Aim and shoot with the mouse. Keys 1,2,3,4 for special powers.